Welcome to the April 2009 edition of the Europe Travel Carnival, where you’ll find posts to inform, inspire and entertain you if you love travel in Europe. I was intrigued by the title, Travel or Cruise to Knit submitted by the Happy Hotelier but it appears that having an interest in knitting can encourage you to travel as there are even cruises designed for knitters. Let’s hope that they serve real as opposed to knitted food at meal times. In Camping in the Wild: Europe posted at WorldWalk-Peacetour, we read about the experiences of cmaping wild in Hungary, Austria, Germany, French and Spain. I appreciate that wild camping allows you to get close to nature but I’m afraid that it’s is too far outside my comfort zone. You can read tips about wild camping in the UK in a guest post on the Europe a la Carte blog. 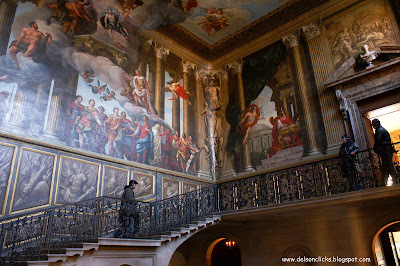 Delson Roche of Lush Green has some beautiful photos in his post Hampton Court Palace – Meeting King Henry v111. Sounds Delson really enjoyed his visit to Hampton Court Palace. I visited about thirty years ago and I still remember it as a wonderful day out. Liz Wright explains that she had to emphasise she had visited the Greek island of Paros as opposed to the French capital in I Said Paros, Not Paris posted at Travelogged. In My own private World Heritage Site: The Plantin-Moretus Museum, Geoff of The Itinerant Londoner highlights that there are plenty of worth sites which have included as World Heritage Sites. That could be a bonus if you do manage to seek them out they are less likely to be mobbed with other visitors. Stig Kristoffersen describes Budapest – Hungary is an Unforgettable Experience With Its Magnificent Beauty Which Never Ends on Information about Budapest. Several people have recommnended that I visit Budapest and it’s yet another addition to my would like to visit list. The buoni ristoranti in Italy on Simply Gluten Free lists Katherine McMahon’s recommendations of restuarants in Italy which can serve food for those who suffer from gluten intolerance. In Finnish Emergency Medicine: One American’s Experience posted at Living the Scientific Life, Girl Scientist descrbies her first class treatment in the Finish medical system after falling on ice and fracturing her wrist. Fortunately the tab was picked up by her insurance. I always advise travellers to take out travel insurance and this is a cantionary tale. This is the final edition of the Europe Travel Carnival, as I’ve made the decision to give up hosting the Carnival, due to the large number of irrevelavant and spammy submssions and the reluctance of many contributors to link back to the Carnival to give us all more link love and publicity. This entry was posted in Travel Tips on April 6, 2009 by Karen Bryan.